If your family is anything like mine, they amount of groceries you need to buy on a weekly basis is forever increasing. I have no idea how my kids manage to eat so much, but they do! They are currently only 4 and 8 years old so no doubt it’s just going to get worse. Thankfully, there are some great ways to keep the grocery bill in check, without having to sacrifice quality or starve the family. It’s important to me to never give up good food just to save a few dollars, and I’m sure many of you feel the same way. 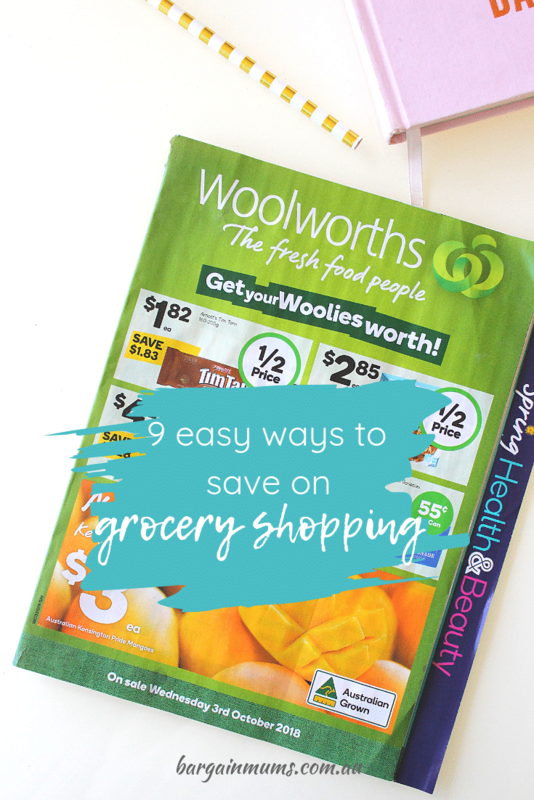 These 9 ways to save on grocery shopping will keep your grocery bill under budget, while still keeping those tummy’s full and your family happy and healthy, ensuring you get your Woolies worth. Does it really matter how your fruit and vegetables look on the outside? As long as they are fresh and tasty on the inside, who really cares if your carrots are not quite regular shaped? Woolies exclusively offers the Odd Bunch range at a better price than their regular produce. If you are anything like me and go through a massive amount of fruit and vegetables each week, shopping from this range is going to save you a small fortune. Even better, not only does buying ‘imperfect’ fresh produce drastically reduce your grocery bill, but it also helps give farmers extra support. Shopping the Odd Bunch range actually makes you feel like you are doing good, in more ways that one! If you are a member of any home organising or money saving groups on Facebook, you will have probably noticed the trend of people stockpiling groceries that they buy on special. The idea is that over time, they cut their grocery bill by at least half by stocking up on these items when they are on special. This avoids having to buy the items at full price when they run out. While you don’t have to take stockpiling to the extreme and stash enough items to last your family years, stockpiling supermarket specials on a smaller scale is a fantastic way to reduce your grocery bill. Next time you get your weekly Woolworths catalogue, flick through and keep an eye out for the half price offers. If you don’t get catalogues in your letterbox, you can check them out online. Take note of the items that you use on a regular basis, because these are the items you want to stock up on! You don’t need to stock up on enough of the items to last you a year or two, but it is a good idea to buy enough to last you at least 6 weeks. So if you go through a bottle of clothes washing liquid every 3 weeks and you notice it is half price in this week’s Woolworths catalogue, stock up on at least 2 bottles. When it comes to brands we all have our own preferences. We might like what the company stands for, feel that the quality is better or just fall for pretty packaging. There is nothing wrong with having a few brands that you are loyal to. There are some basic items that are really no different from any others, no matter which brand you buy. Even if you are a self-confessed brand snob, these are the items you want to purchase the supermarket versions of. Think items like flour, sugar and other pantry basics. Besides, supermarkets own brands are way better quality than they used to be. When you next do the grocery shopping, keep and eye out for the Woolworths food range – the one with the Woolies logo on a green label. These brands will tend to be much cheaper than other name brands, and the quality is usually just as good. 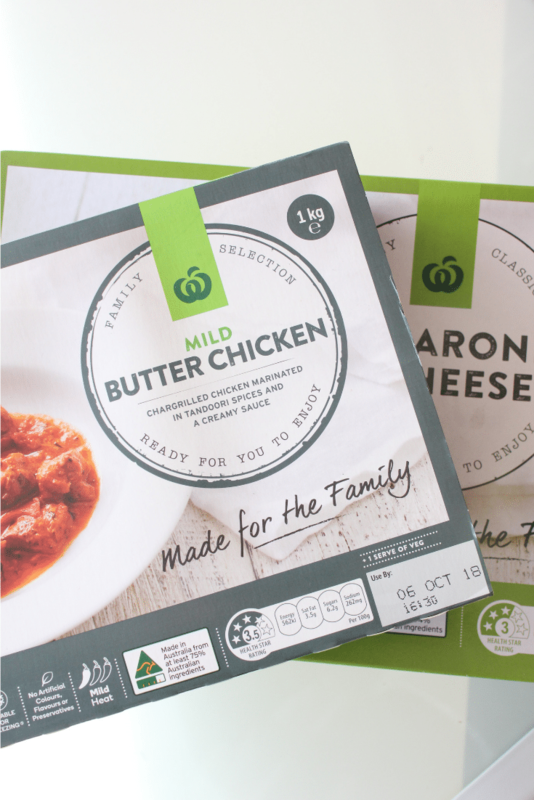 When I’m looking for a particular item in the supermarket, I always check to see if there is a Woolworths version, which makes a massive difference to my weekly grocery bill. For example, I prefer the 1L tubs of Woolworths ice cream to any other brand, in particular the Honey Caramel Macadamia. It’s well known that meal planning is a great way to cut your grocery bill. Meal planning stops you from randomly filling the trolley with items, only to get home and realise you have spent $200 yet have nothing you can make a full meal from. Meal planning is a fantastic way to be sure your shopping will be under budget before you even hit the supermarket. If you want to use meal planning as a tool to save even more money, try meal planning based on the supermarket catalogues. First of all, when the catalogues hit your letterbox each week, flick through to find the supermarket catalogues. I always go straight for the Woolworths catalogue since I know they tend to have the best specials each week. Make yourself a drink, and sit down with the catalogue, a notepad and pen. It’s time to get planning. As you flick through the catalogue, keep an eye out for any items you know you could make a meal from. For example, if I see zucchinis are on special, I add Zucchini Slice with a side salad to my meal plan. If I see taco kits are on special, I add tacos to my meal plan for a night I know we will need a quick and easy meal. It helps to have two lists on the go as you do this, one for your meal plan and another for your shopping list. That way, as you create your meal plan you can simultaneously add any items you will need to your shopping list. Bonus points if the items you base your meal plan on are half price in the Woolworths catalogue. There is little point doing a full grocery shop when the fridge and cupboards are full. Try make a habit of using the food you already have in the house before you head for the supermarket. I’m always amazed at the meals I manage to create when I think there is no food left in the house. All you need is a little creative thinking. If you have a few vegetables in the fridge, you could turn them into a soup or grate the vegetables to make a vegetable slice. Some leftovers are also perfect for freezing ready to use at a later date. Woolworths have put together some fantastic ideas for using leftovers on the Food Savers section of their website. If you regularly shop at Woolworths and haven’t done so already, sign up to the Woolworths Rewards program. Grocery shopping is something you are doing anyway, so you may as well cash in on the Rewards points. Woolworths Rewards points give you $10 off your grocery shop once you reach 2,000 points, and you get 1 point for every $1 you spend. Anything that helps reduce your grocery bill is a bonus! 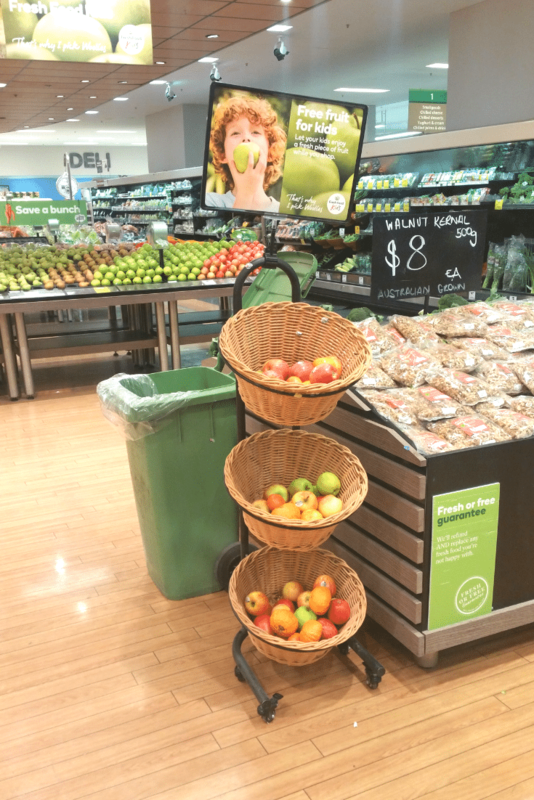 Have you noticed those baskets filled with fruit near the front of every Woolworths store? The fruit is free, and it is by far one of the best ideas supermarkets have come up with. Let the kids choose a piece of fruit when you first enter the store and I can almost guarantee they will not demand anything and everything as you walk around the store. The free fruit saves you money and lets you shop in peace (for a few minutes anyway). We know it’s best for us adults not to shop on a empty stomach if we don’t want to come home with the entire supermarket, and the same can be said for the kids. I always make sure there are a few easy, ready to go meals in the freezer. Whether it’s a packet of frozen fish and frozen chips that can be served with salad, pre-made meals from the fridge section in Woolworths (we especially love the butter chicken and macaroni and cheese) or some meals you have made in bulk to freeze. Having a few meals ready to go in the freezer makes busy nights so much easier, and also cuts down the urge to get takeaway when you don’t have the time to prepare a meal from scratch. Shopping online is a great option, especially if you have young kids. It’s also a great way to save money on your grocery bill. When you grocery shop online, you can control your trolley total in a way that you can’t easily do in store. If you have set yourself a weekly grocery budget and you go over that amount when shopping online, you can easily have a look over your basket and see if there is anything you can remove to bring the total back under budget. I have always found the Woolworths online store to be the best. The website is easy to navigate, and best of all the prices are always the same as they are in store. Who wouldn’t prefer to do the grocery shopping in their pjs?